Illumines the realm of space universally. And now a guiding master appears. The Buddha now has come into the world. Let us all gaze upon him in reverence. Whose radiance reaches all world realms with inexhaustible light. His net of light is ultimately pure. Which pervade the ten directions. And those who hear it are all delighted. 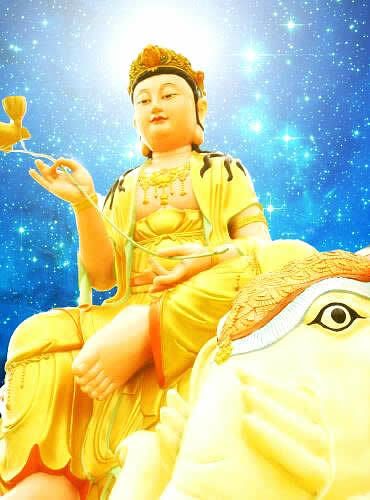 He praises the Buddha’s merit and virtue. All living beings are blissfully at peace. And their hearts bring forth great joy. Which manifest praising the Buddha. From inside the Way-place amazing sounds come. And able to end all the sufferings of beings. Thus is the Buddha’s spiritual might. While in their hearts comes forth great joy. Of all the cities and rural towns. Beat on the great drum at once and assemble. And form a procession to go see the Buddha. So they gather to see the Thus Come One. Should all be made clean and tidy. In empty space—a magnificent display. Let every place be filled with them. Let us form a procession and go see the Buddha. And densely fill empty space with them. Crescentric necklaces made of jewels. All such things you should shower down. Shower them down and fill up empty space. All those should be made to float in empty space. As in our hearts we bring forth great happiness. Endeavors from ancient times past. Such things I witnessed entirely. To adorn and make pure all kshetra seas. And adorn and make pure all kshetra seas. See the Way practiced by all the Buddhas. Pure and brilliant, vast in scope.